By this time of the year tomato potato psyllid (TPP, Bactericera cockerelli) populations are peaking in potato crops. A bacterium, Candidatus Liberibacter solanacearum (CLso), is carried and passed on by TPP, and by now its symptoms can be visible in foliage and tubers. In tubers those symptoms are called zebra chip (ZC) disease, which results in darkening of the potato chip when fried. TPP is a small insect, approximately the size of an adult winged aphid. Adults and nymphs feed on the phloem in a plant and do so by puncturing the leaf, similar to the way a mosquito bites people, so feeding damage is basically invisible. Both adults and nymphs can carry CLso. However, not every TPP carries and therefore transmits CLso; only a small percentage of the population tests positive for the bacterium. There is no indication on the outside of the adult and nymph of whether it is infected with CLso or not. Not even the white stripe on the adult’s abdomen is an indicator; this will become more apparent or visible as the adult psyllid darkens with age. Adults have to be screened with molecular techniques (polymerase chain reaction or PCR), to ascertain whether they carry the bacteria. A current government-funded project is looking into regional genetic differences between TPP populations in New Zealand and whether the percentage of CLso-infected TPP varies throughout the growing season. Non-infected TPP can acquire CLso when they feed on an infected potato plant. Once TPP has infected the plant with the bacterium there is no way back; the plant is infected and some degree of damage will be done. CLso cannot be prevented from reaching the tubers even if a spray is applied within 4 weeks after seeing the foliar symptoms. Once a plant is infected with CLso, it takes about 4 weeks for the foliar symptoms to become visible and to find visible tuber symptoms. The symptoms are a response of the plant to being infected with CLso, they are not the bacteria themselves. Host plants of TPP and CLso are found in the nightshade (Solanaceae) and bindweed (Convolvulaceae) families. Research was conducted on the role of non-crop host plants, to increase knowledge about the role of these plants in the life cycle and ecology of TPP and CLso. We now know that non-crop host plants are important in the ecology of TPP, as the insect’s life stages are present year-round on these host plants, these plants provide suitable feeding and breeding substrates throughout the year (Figure 1), and increased numbers of TPP are observed when African boxthorn (Lycium ferocissimum) is growing adjacent to potato crops. Additionally, we detected CLso in wild-collected thorn-apple (Datura stramonium) and Jerusalem cherry (Solanum pseudocapsicum) outside the cropping season in Hawke’s Bay. Although the incidence of weeds infected with CLso in the environment may be low, these weeds may be a potential reservoir for the pathogen and the vector in the absence of a suitable crop host, providing an inoculum source for infection of subsequent crops. During the year, there is a low background population of TPP flying around in the environment even in areas where there are no crop hosts present. However, when African boxthorn was present adjacent to a crop, there was increased activity nearby and an ‘edge effect’ (insects more abundant at the edges of the crop than in the centre) could be observed in the host crop. Research on TPP, CLso and ZC in Canterbury this year is grower-initiated and focuses on end-of-season management of TPP and desiccation. With organophosphates (OPs) being phased out and neonicotinoids being reassessed by the Environmental Protection Agency, chemical controls other than OPs and neonicotinoids for late-season management of TPP are being investigated for process crops. Tubers will be tested for ZC at several time points in the growing season and after desiccation. This will ascertain when ZC becomes prevalent in a potato crop, which may inform the timing of pest management. In seed crops, our focus this year is quite similar to that in process crops; when does ZC appear in the crop? In both projects the focus is on desiccation. In process crops, other desiccation techniques will be tested in addition to standard Reglone® plus OP sprays. In seed crops, the focus is on whether ZC appears or increases after desiccation, as field observations have shown that re-growth can be heavily infested with TPP, which can lead to late infections with CLso. In this case, ZC symptoms may not show at harvest but can, depending on the cultivar, increase in storage. In the North Island, reduced spray programme adoption trials are being conducted and feedback is requested from grower groups after using the programme and the likelihood of future implementation. In the United States, yield effects were observed because of TPP feeding, often referred to as psyllid yellows. 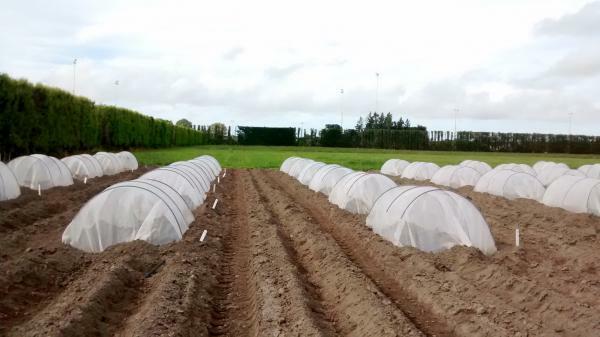 We are in the second year of investigating the effect of feeding of non-infected TPP on tuber yield and quality in a cage trial in Lincoln (Figure 2). CLso-free TPP have been released onto potato plants at different times in the plant’s physiological stage and yield parameters are being assessed at harvest. This trial is ongoing and results are available later this year. Figure 1. 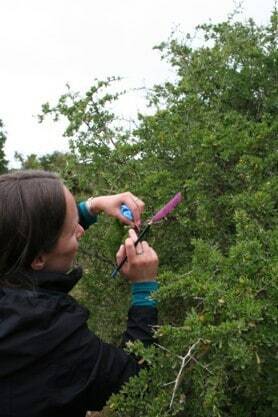 Counting tomato potato psyllid life stages on African boxthorn in winter in Canterbury. Figure 2. The cage trial to study the effect of tomato potato psyllid feeding without the bacteria present on potato tuber yield and quality. Acknowledgements: Research discussed is funded through the Plant Biosecurity Collaborative Research Centre, Potatoes NZ, MBIE and Plant & Food Research core funds.